Meet your new favorite pasta dish! 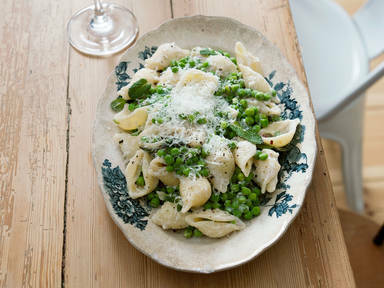 This spring pasta is a comfy yet refreshing dish. Get ready for not one, not two, but three different types of cheese to cheer you up after a long, cold winter! This dish is not too heavy, but gives you enough energy to start spring off on the right foot. If you don’t get fresh peas, simply switch them out with frozen ones.